I have designed an award that I would like to give to those pages dedicated to the Fire and EMS service. If you have a page you would like to receive this award email me with the URL and why you feel the site deserves the award. 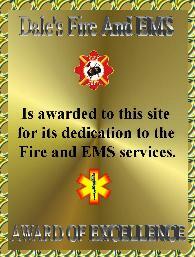 Once I veiw the site and I ensure it is dedicated to Fire And EMS I will award it. Thank you. This is what my award looks like.